Karmarama has hired Krow's Rob Turner and Dave Westland as creative directors. Turner and Westland joined Karmarama this week. The pair will handle the Costa and Iceland accounts and work on pitches. They will report to the incoming chief creative officer, Nik Studzinski. At Krow, where they spent two-and-a-half years as creative directors, the duo oversaw brands including DFS and Fiat. They started working together at Hooper Galton (now part of VCCP). During their previous stint at Karmarama as freelancers, Turner and Westland adopted a llama and gave the adoption certificate to the agency as a leaving present. Karma­rama has since embraced the llama as its unofficial mascot and has a fibreglass "Karma Llama" (pictured) in its offices. 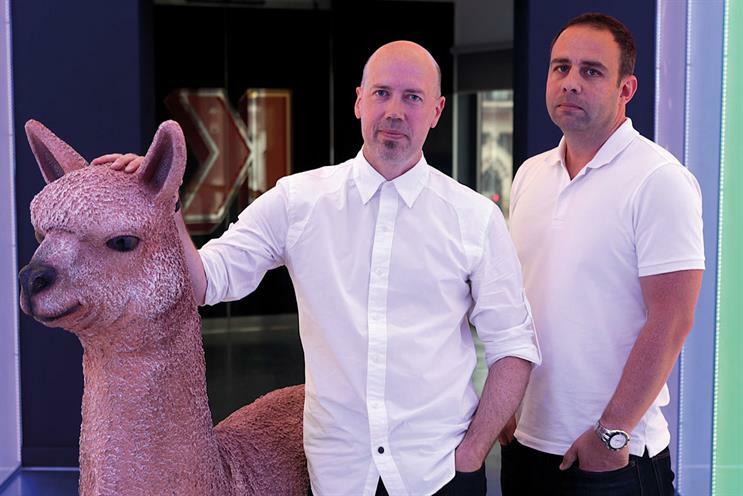 Jon Wilkins, Karmarama’s executive chairman, said: "Rob and Dave are brilliant and award-winning creative directors, so we’re thrilled to have them back at the agency – they also previously gifted us the Karma Llama, which makes them already part of Karmarama legend." Karmarama’s group executive creative director, Caitlin Ryan, is leaving the agency later in the year. News of her departure followed the announcement in May that Studzinski was leaving Droga5 to replace Dave Buonaguidi as the chief creative officer. Turner said: "Karmarama has a lure that is hard to resist. We loved our time here when freelancing so when the opportunity arose to come on board full-time, it was an easy decision. We look forward to some special K times ahead."